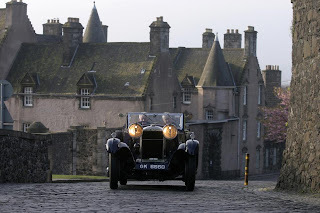 If you’re doing nothing special this weekend, why not pop down to Turnberry Hotel on the Ayrshire coast on Sunday (29th April) for the start of the 2012 HERO Scottish Malts Classic Reliability Trial and Classic Car Tour, a ‘competitive’ tour of Scotland for cars built before 31st December 1981. The entry has more than 40 classic cars ranging from the very first right hand drive production Jaguar E-Type Fixed Head Coupe (supplied by Jaguar Cars in August 1961) to a 1930 Riley Brooklands 9HP and two Jaguar SS100 machines. Documentation and scrutineering will take place on Sunday 29th April at the Turnberry between 11.30 am and 4.30 pm although the event proper doesn’t start till Monday morning when former Jaguar test driver Norman Dewis will flag off the competitors at the start of this 5 day event which finishes back at Turnberry on May the 4th. There will be two competitive tests within the grounds of the resort at the Start and competitors will then navigate their way round the route (200 to 230 miles each day) using a detailed ‘Jogularity’ style road book with Tulip diagrams. Along each day’s route there will be a number of driving tests on private land, regularity sections on some of the most stunning roads in the country and link sections allowing both crew members to enjoy the spectacular scenery of Scotland. Event organisers, HERO, are also inviting the Scottish public to take pictures of the cars and email them to the organisers for a photographic competition split into two classes - children and young people up to the age of 18, and adults. The winners will receive specially engraved cups and other goodies just as the drivers of the event do.